One fan noticed Andrew Gross’s balk before everyone else. His yell reverberated through a tense Lupton Stadium crowd before anyone realized what had happened. 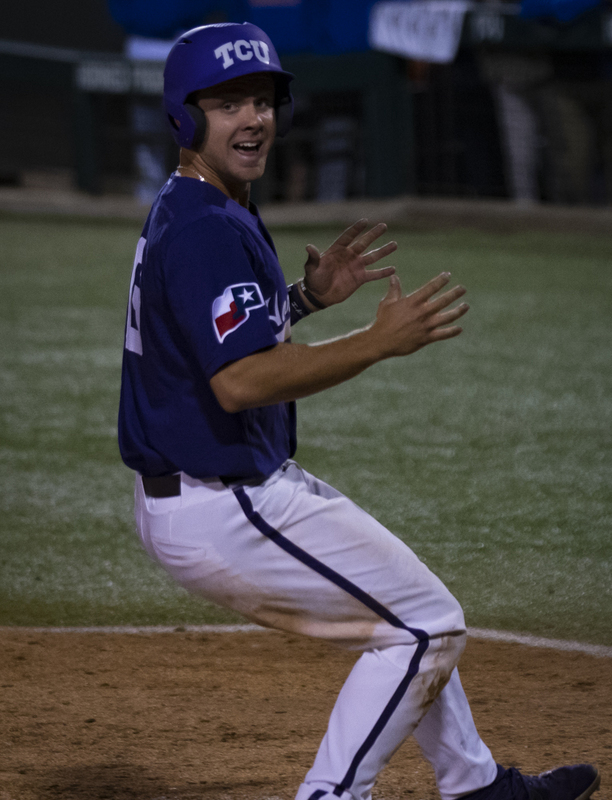 Moments later, Hunter Wolfe was stepping on home plate and finishing off the Horned Frogs’ comeback in one of the most unusual ways possible. The balk gave TCU a 3-2 win over UT-Arlington and marked their second ninth inning comeback of the season. Two quick outs in the bottom of the ninth brought backup catcher Zach Humphreys to the plate with the Horned Frogs trailing 2-1. Humphreys found himself down 0-2 in the count against Gross, who has recorded more strikeouts than hits given up this season. Down to his last strike, Humphreys watched three straight balls and then fouled off two more pitches before connecting for a single to right. Leadoff hitter Hunter Wolfe would follow Humphreys and also found himself down to his final strike. He would foul off two pitches before knocking a single to right and advancing Humphreys to third. In total, the Frogs would see their potential last pitch 11 times. Now with runners on first and third, senior Josh Watson came to the plate and hit a double down the left field line, scoring Humphreys and tying the game at 2. The Mavericks walked Jake Guenther, bringing Austin Henry to the plate with a chance to win it for the Frogs. But he wouldn’t get the chance to, as Gross balked before his first pitch and sent Wolfe home for the game’s winning run. Entering the ninth, TCU had been unable to piece together consistent offense and had a few unforced errors that allowed the Mavericks to take the lead. 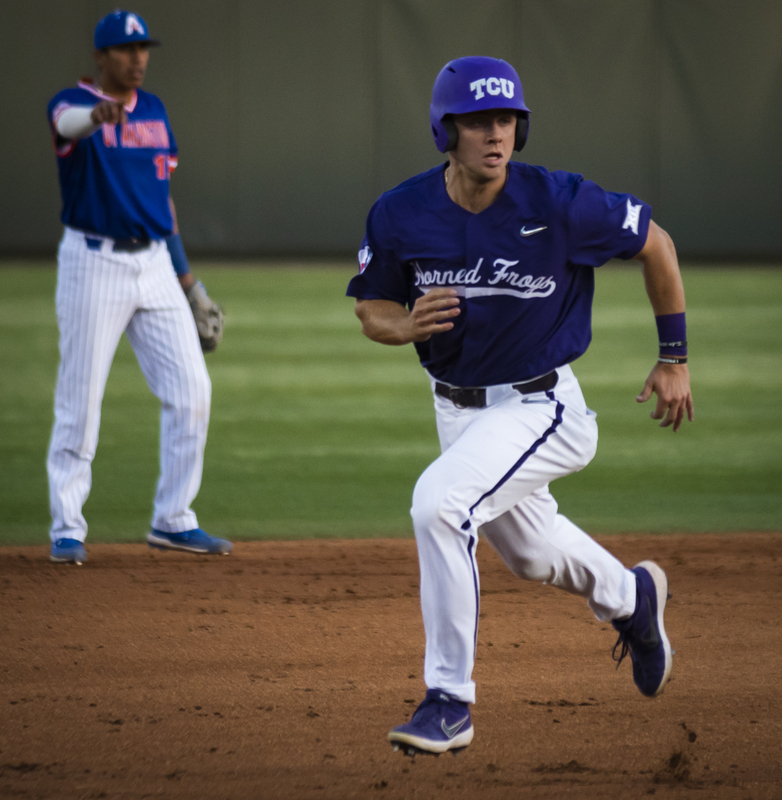 The Frogs finished with 13 hits, but only two of them had come consecutively entering the ninth. Mavericks starter Drew Gooch, who played for TCU for two seasons before transferring, gave up no earned runs and struck out two in 5.2 innings. Schlossnagle said he was envious of the quality pitching that Gooch is providing the Mavericks, something he thinks his team in lacking in. UTA pulled ahead 2-1 in the seventh after Zac Cook scored on a passed ball. Cook had singled earlier in the inning and advanced around the bases after three unforced errors from TCU. To win despite the unforced errors and lack of offensive consistency is a testament to the team’s depth, a trait that can carry them far into the postseason. Schlossnagle and Watson pointed specifically to Humphreys, who has seen his playing time reduced since last season with the addition of Alex Isola. The team will look to carry the momentum from the walk-off win into their first road conference series of the season. They will take on Oklahoma this weekend, with the first pitch set for 6:30 p.m. Friday in Norman.